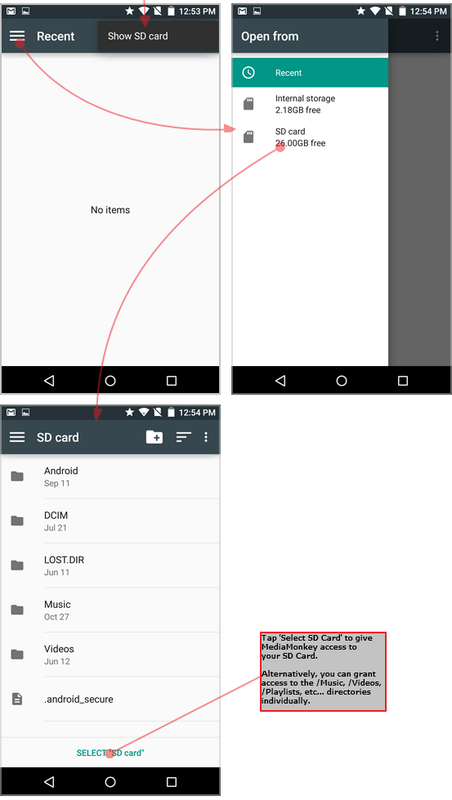 Android 5 and up allow apps to save/edit content to shared directories (such as /Music) on an SD card (in contrast to Android 3 / 4 which only allowed apps to save/edit content to an app-specific directory on the SD card that was inaccessible to other apps, and is deleted upon the app's removal). MediaMonkey for Android 1.1.3.499 is the first version to support this feature. 1) Sync profile: MediaMonkey for Android and MediaMonkey for Windows must have an active sync profile for the apps to recognize one another. 2) Permission: MediaMonkey for Android must have permission to write to the external storage location of the SD card, in order to be able to edit / delete / sync content to the SD card. 3) Inclusion in the library: In order for content to be visible in the MediaMonkey for Android library, the location on the card containing the content must be configured to be part of the library. To sync content, MediaMonkey for Android and MediaMonkey for Windows must be configured to recognize one another so that they can sync. If MediaMonkey for Windows does not recognize your device or your device cannot see MediaMonkey for Windows see step 3 here. MediaMonkey automatically displays a dialog asking the user to grant write access to a folder on the SD card (if the user skips this, it's possible to restart this via Options > Grant access to external storage). MediaMonkey then opens an Android system folder chooser dialog, from which the user can choose a specific folder (or the entire SD card) in order to grant MediaMonkey access to that location. 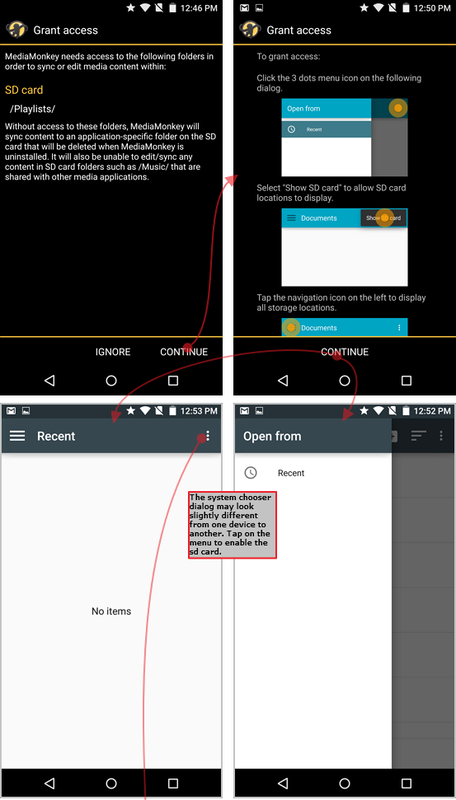 On some Huawei devices 'Open from' (see above) will only show SD cards after first enabling [x] Show advanced devices (in 'Settings'). Then navigate to the SD card and 'Select all' (as there is no 'Select SD card' option). On some Xiaomi devices, after installing MediaMonkey (but before running it), you need to go to Settings, Tap on Installed Apps, Tap on Documents, Tap on the "Enable" icon on the bottom in order to grant access. Then run MediaMonkey for the first time. Shared folders may not be supported on certain devices if MediaMonkey is unable to validate the external storage. For such devices synchronization is limited to writing to app-specific folders. Once permissions are granted, MediaMonkey will automatically move files from app-specific directories (i.e. from SD Card/Android/Data/com.ventismedia.mediamonkey/Music) to shared directories (e.g. SD Card/Music) and automatically includes standard media locations such as /SD Card/Music etc. within the library. If content from the SD card appears to be missing, you can manually add new locations via Options > Choose library folders.